Twelve individuals today decided that Ademo Freeman was guilty of three counts of felony wiretapping for recording his conversations with public officials per his attempt to bring accountability to a situation where it was noticeably absent – the assault of 17-year-old Frank Harrington, a student at Manchester’s West High School at the hands of Darren Murphy, the school resource officer and employee of the Manchester Police Department. Ademo is ordered to spend 12-months in the so-called “House of Corrections” with 9-months suspended. He’ll then be under “good behavior” for the next five-years, which, if violated, means strangers with guns will force him into a cage at state prison in Concord for two one-to-three-year stints. With “good time” he should be out in mid-October. Though the trial wasn’t set to begin until 10am supporters of Ademo were out-front of the court at 8am with signs, jury nullification tri-folds, and smiles. 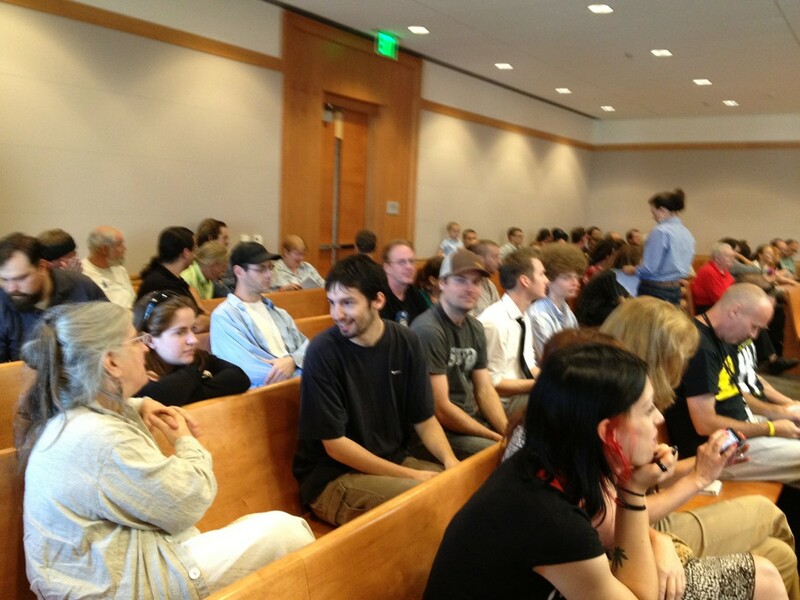 After engaging in outreach the growing crowd moved inside to courtroom #4 at Hillsborough County Superior Court. Ademo wore a black suit, black shoes, and his Never Take a Plea t-shirt. Over 90 friends and supporters were present to greet him as he entered. Ademo was told by judge Kenneth Brown that he could include jury nullification in his arguments. The 15 jurors and alternates – 10 woman and five men – were led in. The three complaints against Ademo were read. Each one put-forth that he’d acted “against the peace and dignity of the state.” Huh? Just who is “the state”? Doesn’t the accused have the right to face their accuser? Michael Valentine, employed at Hillsborough County Attorney’s Office, gave his opening statement. 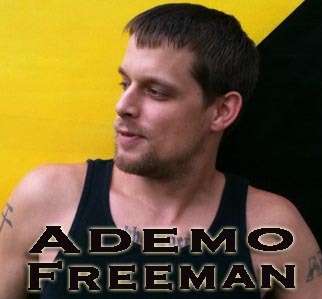 He argued that Ademo “doesn’t want to follow the law” and needed to be punished. He told the jurors that though Ademo claims to stand for accountability his actions demonstrated the opposite, and that real accountability will be had through the court proceeding. Valentine further pontificated to the jury that what Ademo would present is “not evidence”, that Ademo’s actions were “criminal”, and that Ademo was going to create a sideshow and advised the jurors not to allow themselves to be distracted. Immediately after Ademo finished his opening statement he and Valentine were asked to converse with Brown, which soon resulted in Brown advising the jurors to disregard Ademo’s mention of the potential punishment he might incur. David DuPont, an employee at Manchester PD was the first to testify. He disclosed that he went to West High School and interviewed Denise Michael and Maryellen McGorry about their conversation with Ademo. Ademo asked DuPont if any of the alleged victims had contacted him with their complaints. DuPont responded in the negative, and disclosed instead that he’d been instructed to by a colleague (Carlo Capano) to investigate the calls. 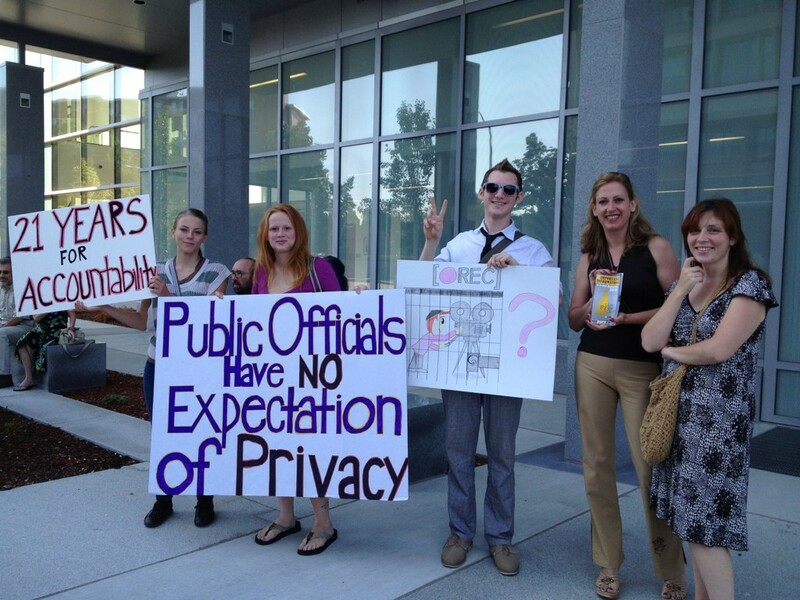 Ademo questioned if public officials have an expectation of privacy. DuPont, obviously not new to testifying, gave some non-committal responses. After Ademo’s questioning of DuPont, Valentine asked follow-up, just to muddle the facts a bit more. Hopkins acknowledged that he was already familiar with Cop Block, having been on the site and included in a video featured and even offered that he was well-aware that those associated with Cop Block typically filmed interactions with police. Ademo stressed that Hopkins was well-aware of what the site’s goals were and that his mention of “seeking comment” when making the phone call to Manchester PD should have been heads-up enough that he was documenting their conversation. Ademo asked Hopkins if he would have acted any differently if he knew he was being recorded. Hopkins responded in the negative. Ademo asked Hopkins how the recording victimized him, to which Valentine objected. 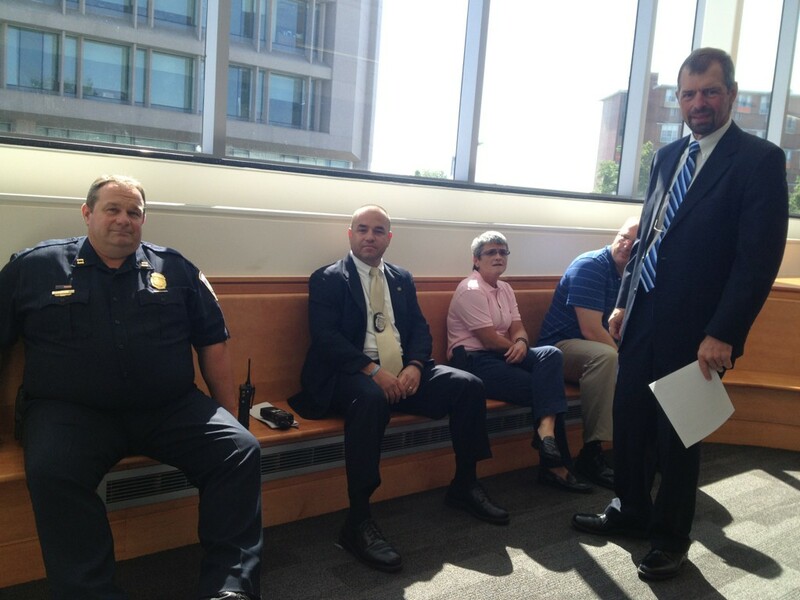 Third to take the stand was MaryEllen McGorry, the principal of Manchester’s West High School. When asked by Valentine about the responsibilities of her position the first thing she noted was not anything like “educating students” but “keeping order.” That pretty much set the tone of her testimony and her demeanor throughout the proceeding. Valentine allowed McGorry a lot of time to expand on her privacy concerns of students until Ademo finally objected due to relevance (noting that she was the alleged victim, not the school) to which Brown agreed. Ademo asked McGorry if she had previous been aware of CopBlock.org and she acknowledged that she’d learned of the site the week prior to the October 3rd, 2011 incident. Asked if she proactively had blocked the site from school computers she noted that she hadn’t but it likely was done by the school district since “that would not be considered an educational website.” She also admitted to have told at least one student to remove their t-shirt, which donned the “CopBlock.org” URL. Censorship for the win. McGorry later stated that she was not a public servant but an employee of the city of Manchester. Convenient. I think this claim was made thanks in large part to McGorry’s previous life as a Hillsborough County attorney – she knew that self-defining as a public official – even though that’s an accurate label – would make it easier for Ademo to make his case – that he had every right to record public officials in the course of their jobs. That there was no expectation of privacy. And therefore, that his call – which she knew came from someone affiliated with CopBlock.org who was seeking comment – should not then fall under the auspices of wiretapping. The third alleged victim of wiretapping – Denise Michael – was said by Valentine to not be able to be present this day. 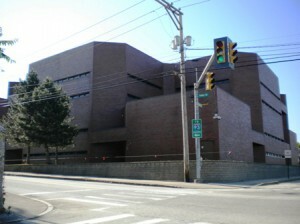 Instead of waiting another day to hear her testimony, after a brief huddle with Ademo and Valentine, Brown shared with the jurors some agreed-to facts – that Ademo had called West High School, didn’t inform of recording (only that he was from CopBlock.org seeking comment), and put that short clip online. The jurors were dismissed and things were placed on hold for an hour for a lunch break. When we returned we were told that all electronic devices were banned. Previously it had only been communicated that we couldn’t take pictures or video (only two cameras – WMUR and Ian Freeman of Free Talk Live & FreeKeene.com had been allowed). The only thing that had changed was that a woman employed at WMUR, the news station out of Manchester who’d been working on her laptop during the morning testimony, was now absent. A double-standard? Ademo’s closing took only a few minutes but it was strong and straight-forward. He acknowledged that he hadn’t informed those that he called that he was recording but he hammered-home the fact that they were public officials, that they knew he was affiliated with CopBlock.org and was seeking comment, and advocated for jury nullification. Valentine took about seven minutes for his closing remarks. He told the jury that it wasn’t up to Ademo to decide the law but to the legislature. He also made the outlandish claim that Ademo “doesn’t want you to have rights”, causing an audible gasp among those present, which earned a warning from Brown. Brown gave jury instructions for the next 15-minutes. At the conclusion Valentine requested that Brown re-read the three prongs of the wiretapping statute, since he said the first time through a relevant word had been misstated. Brown complied. After he finished Valentine again requested it be re-read for the same reason. Brown asked those in the court if he’d correctly stated the word and everyone present stated he had. Personally, I think it more plausible that Brown hadn’t misstated the word but that Valentine indirectly wanted to have the last word – for it to be the last thing the jurors were told. And told again. After the jury left to deliberate, Ademo got a round of applause. The jury deliberated for about 50-minutes, we all reconvened, and the jury foreman communicated a “guilty” verdict on all three counts, each of which carried a maximum of seven-years in prison. Brown took a recess for 10-minutes then sentencing was to begin. As the jurors walked to their cars many of us also left the building and attempted to engage them in conversation and ask them if their actions jived with conscience. None stopped to talk. Most didn’t even acknowledge us. I asked one older lady if she would have done the same thing if, instead of Frank Harrington who was assaulted by Murphy, it had been her grandson. I asked others to think about the repercussions for their actions. To think about what kind of society they’re leaving the next generation. To think, in a historical context, about what happens when people unthinkingly side with individuals “just doing their job. We returned to the courtroom. Brown asked Valentine for sentencing recommendations from Valentine and Ademo. Despite telling Ademo on Friday that he’d ask for the same stipulations he outlined in the first plea deal he had previously extended, Valentine made the case for something much harsher: a year in Valley Street Jail with five years of “good behavior”, which, if violated, would have earned Ademo a trip to the prison in Concord for 1-3-year stints to be run consecutively. Admittedly, he could have asked for 21-years (as each wiretapping charge carried a maximum threat of seven-years). I think even Valentine realized the pushback such a request would garner. The motivation cited by Valentine was Ademo’s previous felony in Wisconsin (for the non-violent, non-victim action of engaging in the sale of a plant) and his resisting charge in Manchester. In no uncertain terms, Valentine told Brown that Ademo’s “purpose” is to “disrupt government”, “to be disobedient”, and “to clog the court system” and that the sentence was requested to punish Ademo and deter his supporters. Ademo asked Brown to think about how Valentine’s request would mean resources would be allocated – noting that “jails weren’t built for people who make phone calls or use chalk.” He also made clear that “there’s going to be no rehabilitation”, that he’ll continue to act as he has, in calling out those who wrong others. Brown told Ademo that he was sentenced to 12-months in the so-called “House of Corrections” with 9-months suspended. He’ll then be under “good behavior” for the next three-years, which, if violated, will land him in the state prison in Concord for one-to-three-years. Ademo is supposed to sit for three months. With “good time” that equates to two-months. Brown stated that this time can run concurrent to his present stint [for more on that see: CopBlock.org/Pledge], which began on July 11th and is supposed to end on August 17th. It’s unsure now if that concurrent time will begin today, when this verdict came down, or be retroactive, when he was taken from District Court and brought to Hillsborough County Jail. If it’s the former, as reported by the Union Leader, he’ll be free(r) in mid-October. If it’s the latter, as reported by WMUR, he’ll be free(r) in mid-September. I’m seeking clarification and will update here when it’s ascertained. UPDATE 2012.08.16: Looks like the Union Leader had it correct. Jackie, a court assistant at Hillsborough County Superior Court, stated that Ademo’s three-months began on August 13th.